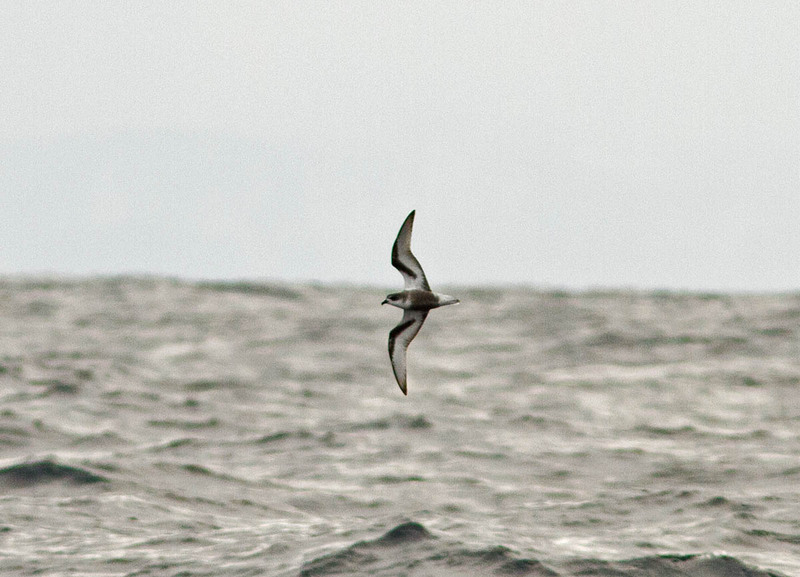 Our pelagic trip report for December 8, 2012 highlighted a Mottled Petrel that we spotted 20 miles off Newport, Oregon. Most North American birders, including seabirders, are unfamiliar with this species. 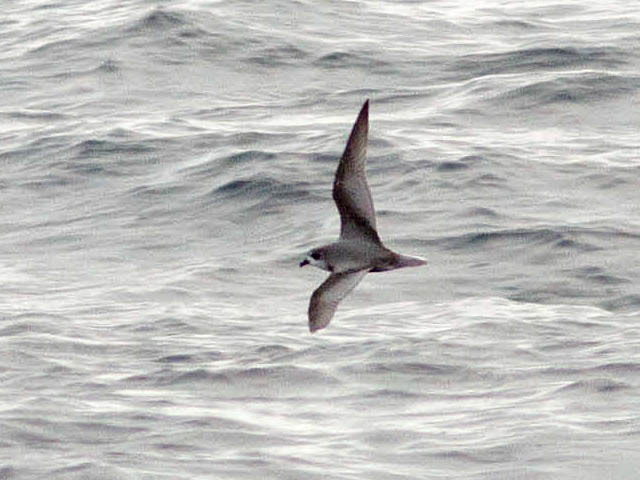 Indeed, this was a life bird for me and one of several rare seabirds we observed off Oregon in 2012 (see Pelagic Birding: 2012 In Review). Mottled Petrels are one of the Pterodroma or gadfly petrels, known for their occurrence far offshore and their wild arcing flight (see: So you want to see a Murphy's Petrel?). In the low winds this day, however, this bird was not flying in high bounding flight on set wings. Rather it was flying low, fast, and direct with rapid wing beats. The ID of this species is straight forward. The bird is the size of a small gull (kittiwake-sized) with dark belly patch. Mottled Petrels breed off New Zealand from October-March. The bulk of the post-breeding movement is diagonally northeast directly through the Central Pacific, past Hawaii, in April-May to the Gulf of Alaska and Aleutians, retracing their route back to New Zealand in October. On the West Coast, presumed failed or non-breeders are found occasionally in February and March, apparently leading the main migratory northward movement by several months. In recent years, birds have been found more regularly in November-December. These are likely young non-breeding birds trailing the main migratory southward movement by a couple of months. This is not unlike the pattern and timing set by Short-tailed Shearwaters. There are additional scattered records throughout the year. Although there have been a couple sightings from land during storms off the West Coast, most sightings of Mottled Petrels are far from land. Typical are 9 birds 60 miles off the central Oregon coast on 31 March 1981; 3 individual birds 45 miles off the central and northern Oregon coast on 11 December 1990; 1 bird 14 miles off the southern Oregon coast on 13 December 1999; 21 birds from 31 October to 1 November 2005 from 58 to 169 miles offshore Oregon (Oregon Bird Records Committee). It appears, then, that the "best" time to find Mottled Petrels from Oregon, Washington, or extreme northern California may be the first half of December. My analysis of weather buoy records off central Oregon reveals that only about 25% of pelagic birding trips using chartered sports fishing boats would be successful in early December--the absolute worst time to try to get offshore during the entire year. Nevertheless, this is absolutely the best time of year to see these rare birds off the West Coast. We'll probably try again next year to charter a pelagic trip in late November or early December to see Mottled Petrels and other winter seabirds such as Laysan and Short-tailed Albatrosses, Short-tailed Shearwaters, Black-legged Kittiwakes, Parakeet Auklets, and Horned Puffins. The year 2012 was very successful for pelagic birding for The Bird Guide, Inc. in Oregon waters. We had a couple of trips cancel, but we also had several very calm trips--I think we had only one calm trip the previous two years prior to this year, so we felt due. Unlike last year with no rare pelagic species found, we had several rare birds throughout the year in 2012. The March Perpetua Bank trip weathered out and we failed to get more than 3 signed up for a trip in April. Going forward we will probably schedule only special search trips in spring, not general trips. There is just not enough general interest for spring trips, despite the great birds and rarities found over the years. Too much land-based spring birding competition. This seems typical for all West Coast pelagic trip providers. All other public trips for the year filled to capacity. That included our May trip for which we extended the duration to 12 hours to reach 45 miles offshore. 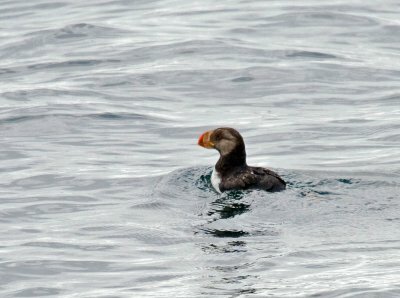 Rarities included a HORNED PUFFIN offshore 28 miles. 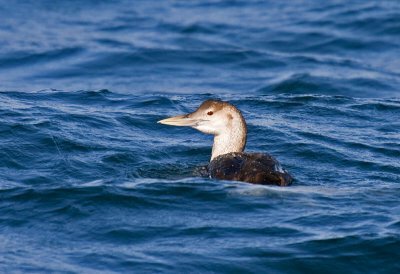 A YELLOW-BILLED LOON was discovered in nearshore waters. We were able to circle both birds with the boats and obtain close views and photos. A private trip in June took a group of home schoolers offshore to see BLACK-FOOTED ALBATROSSES. Such a trip on smaller faster boats are the only way to see albatrosses in a trip of only 5 hours. Other pelagic species included SOOTY and PINK-FOOTED SHEARWATERS, CASSIN'S and RHINOCEROS AUKLETS, 2 TUFTED PUFFINS, and several marine mammals--not bad for such a short trip. A summer trip in July was set up by the Wings tour company. They had 8 participants and we filled the boat with other public birders. Low numbers of the expected species were seen, including a LONG-TAILED JAEGER. For the second year in a row we weathered-out on a late July/early August deep water trip. Hot weather inland creates strong north winds and big waves. The trip filled in only a few days when announced in March. So we'll plan again in 2013--this time with a weather date to give us a second chance. We made it offshore 15 miles on the Charleston, Oregon, Shorebird Festival pelagic trip in late August. We saw the common expected pelagic birds. Calm seas on our September trip allowed us to see a pair of SCRIPPS'S MURRELETS ahead and slow the boat in time to prevent them from flushing away. A couple of SOUTH POLAR SKUAS were also seen. A MINKE WHALE was the first seen in several years. Seas were calm again on our early October trip. We tracked down a group of factory processor ships working off a ways to our north and headed there. Good plan! We encountered a LAYSAN ALBATROSS among the swarm of birds at the fishing vessels, while overhead a SHORT-EARED OWL flopped around! 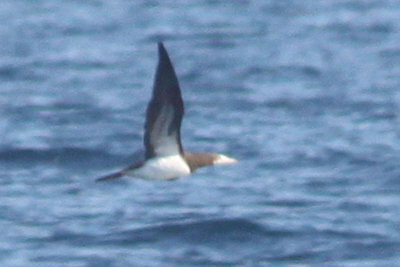 Our third rarity of the trip occurred about 20 miles west of Yaquina Head with a fly-by female BROWN BOOBY--only Oregon's 5th record. Our late October trip found 9 SHORT-TAILED SHEARWATERS and several hundred CASSIN'S AUKLETS. We planned a "Laysan Albatross search" trip in November with a weather date in December. We needed the weather date. Our trip went out in fairly calm conditions on December 8. We found our target bird--a single LAYSAN ALBATROSS. As expected, we found 20 SHORT-TAILED SHEARWATERS. 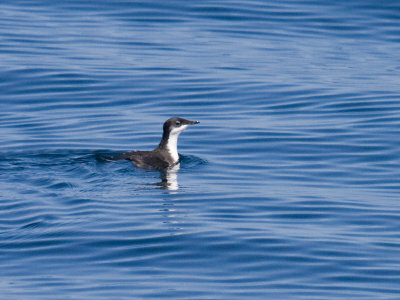 We missed Ancient Murrelets, which were reported in good numbers by shore-based birders. Of the 5 or so possible rarities were hoping for, but not really expecting, we spotted the least likely--2 PARAKEET AUKLETS flushed from in front of the boat, and an obliging MOTTLED PETREL flew by our chum stop! Both species are new to The Bird Guide's total pelagic species list seen since 1994--over 150 trips! Arctic nesting seabirds were in alarmingly low numbers during the fall migration. Fall numbers of all 3 JAEGERS were unusually low. Totals for 5 fall trips were 11 POMARINE, 10 PARASITIC, and 1 LONG-TAILED JAEGERS--typically that is what you might expect on one below-average September trip. Amazingly, SABINE'S GULLS, too, were in unprecedentedly low numbers with 30 in July, but only 1 in August and none(!) in September or October. These should be common throughout the fall, perhaps averaging 35+ birds per trip. We had 5 distant unidentified (ARCTIC/COMMON) TERNS in July. One COMMON TERN was on our August Shorebird festival trip. One ARCTIC TERN and 3 COMMON TERNS were spotted on our September trip. Again, very low numbers compared to previous years. 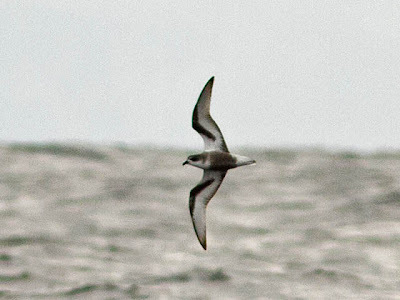 Where were the BULLER'S SHEARWATERS? Our first for the year didn't show up until we saw 4 birds in September, 2 during the early October peak, and 2 on our late October trip. Only 8 total birds on 5 fall trips! We also had one bird on our December 8 trip--very late--but it had an injured wing and could barely fly. Never common, no Flesh-footed Shearwaters were seen this year (or last year), continuing the trend of lower numbers over the past decade. The pelagic birding off Oregon in 2012 was truly outstanding!